Incorporated as a non-profit public cemetery in 1892, the Pine Hall Cemetery is a peaceful resting place in the Centre Region. 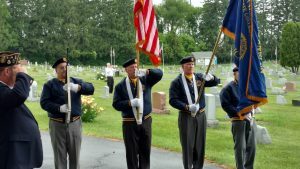 The Pine Hall Cemetery is located 2 miles west of State College Pennsylvania on the 1700 block of West College Ave.
Memorial Day services will be held at the Pine Hall Cemetery on Sunday May 26 at 3:00 pm starting with the traditional raising of 50 flags throughout the cemetery. Brian Querry, Centre County Director of Veterans Affairs, will speak.